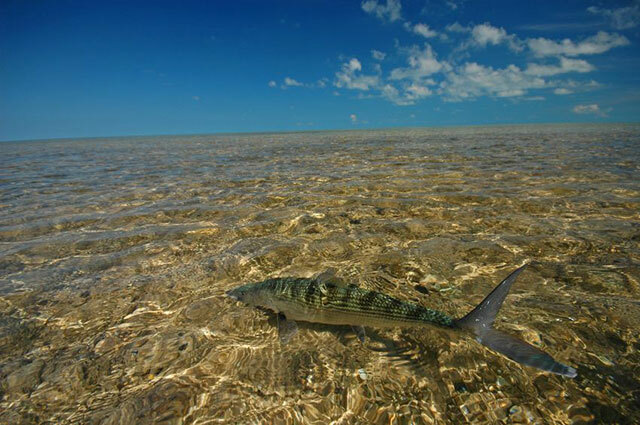 Fly fishing for bonefish has experienced considerable growth within the fly fishing travel industry, with hundreds of new anglers annually joining this migration to the saltwater in search of what many consider to be one of the world’s finest light tackle game fish. Here in the Bahamas we are fortunate in having hundreds of thousands of acres of prime habitat that supports large populations of bonefish, along with enough habitat diversity to produce a decent proportion of trophy-size fish. Catch and release is now the norm, which will ensure that this wonderful game fish is here to stay. Although our numbers and size are impressive it should not be taken for granted that those new to fly fishing can just show up and expect these fish to jump in the boat and start rummaging in your tackle bag for a fly to eat. The ”gray ghost” is hard to see and at times even harder to catch. They were designed that way, and it’s the main reason why this type of angling can be classed as a true sport. Like any first time attempt at something new it can often be a difficult transition to effectively apply your existing skills to bonefishing. Combine the new “alien” environment and technique with generally short outings of 3 to 6 days of fishing and anglers often need many, many years of experience before they really feel confident with their ability to present a fly in saltwater. To try and successfully teach the required casting techniques in the adrenaline-charged conditions immediately before presentation is an almost impossible task. This leads to compromising shortcuts in the hope of producing a few extra fish. This instant gratification process is the slippery slope, creating the proverbial “old dog, new tricks” angler, with the old dog’s learning curve leveling off well before its potential. Even when the fly has been presented the importance of the very much visual requirements of fly animation and bite detection come into play as part and parcel of a series of completely unfamiliar requirements that need to be executed in a matter of a few seconds. This can all add up to disappointment, with the final result of many bonefishing trips being a hard and unsympathetic blow from Mr. Reality. The weather and exposure to its full effects on the open water is another factor, and anglers should remember that a nice breeze enjoyed by the experienced bonefisher is sometimes the reason a novice can blank for the day. The last thing I want communicate is that fly fishing for bonefish should only be experienced by the expert caster and fly fisher. It is not the case at all. The only real requirements are enthusiasm and the eagerness to experience this wonderful sport in the true traditions of fly fishing. But those new to this sport should take a moment to put everything into perspective. Catching fish while fly fishing from the front of a flats skiff for bonefish is never a given, even for experienced anglers. It’s a common occurrence to have fisherman come back from the flats with tales of how slow the fishing was because the angler only landed one or two fish. You if you speak to the guide you discover that the angler was presented with consistent shots for most of the day, yet he missed the target or wasn’t seeing the fish or he broke four fish off — or all of the above. Had he batted .300, for example he would have had ten-fish day. One misperception many beginners share is that success in bonefishing comes almost exclusively from landing the presentation in the proper “zone.” The complication is that “the zone” can be constantly changing, depending on things like water depth, the fish’s speed, wave action or lack of it, and fly sink rate. A fish an exposed deeper flat edge needs a completely different approach than, say, one on the inside in flat-calm and shallow water. Fly presentation is also a far more hurried affair from the front of a moving bonefishing skiff than most anglers are used to in their normal fly fishing environment, and assuming that the fly has been presented in the correct position, then the subtleties of fly animation and bite detection are what often turns an ordinary day into an exceptional one. Each bonefishes’s reaction to the fly is different, and anglers can only begin to notice and understand these subtle changes after they have passed through the stage of “panic presentations” of their first few days or even their entire inaugural outing. An angler’s success at throwing a fly at a school of 200 1-to-2-pound fish in 3 feet of water cannot hold its place on the ladder of success compared to a successful presentation at a pair of “snarfling,” tailing 10-pound fish in 10 inches of water. However it may only take one of the latter fish to make any angler’s trip. Finally, we all eventually learn that the angler with a calmer approach and lower expectations will usually come away with more enjoyment. It’s just the nature of the beast. Bonefishing is not a catching exercise, and every angler needs to value and appreciate the stalking as much as the prize that ends up lying exhausted in their hands and is let go to continue with its life. It’s that level of respect that makes the bonefish such a special quarry for both novice and expert alike.